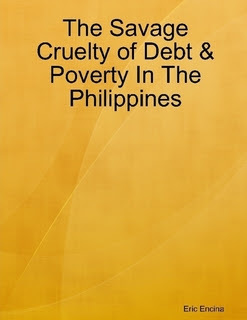 NOTE: This is one chapter excerpted from the book "The Savage Cruelty Of Debt & Poverty In The Philippines" by Eric Encina. See NOTE at the end of this article. Much of the content is applicable to any country where the orthodox, economic system of usury-based, debt money currently reigns supreme. It is cruel that modern economics has been portrayed as a too highly complex discipline for the ordinary people, only made fit for the rarefied intellects of economics faculties to appreciate and comprehend. Most of its graduates bask in the reflected glory of their proud status symbols, and are armed with the latest computerized wizardry, while posing as the present day witch doctors of monetary science. It seems their intent is to technically mislead and adroitly marginalize the greater number of Filipino people who are suffering the savage cruelty of poverty and perpetual financial hemorrhage. Readers are invited to thoroughly examine, the aggregate contribution to the betterment of humanity by the common Filipino people. After a brief study, any readers will see that the obvious inverse proportion and blatant contrast between the multiple millions of poor Filipino people and the prestige and mystique of the wealthy class who enjoy prosperity and abundance without conscience. Finding a better way of doing things has been the happy lot of contemporary industry, as a century of invention has done away with drudgery, the made the oil lamp has become obsolete, as well as the spinning jenny and the wooden animal plough. Only the orthodox, economic model of usury-based, debt money has failed to meet the challenge. Its nostrums dwell deceptively and eternally on controlling monetary wealth, rather than expanding it. The faltering, economic model of usury-based, debt money ignores the many problems such as wars, violence, poverty, scarcity and lack on planet earth which stands ready to give its bounty blessings. Why? The truth is that there is a terrible fallacy in modern economic thinking that is frequently avoided, and/or never debated or subjected to scrutiny. The most ingenious attempts at balanced growth and maximization of resources are commonly avoided as we progress into this 21st Century. This misunderstood fallacy devolves around the creation of credit (otherwise referred to a money creation), and the financial orthodoxy that rules any new money which can only be obtained as an interest-bearing (usury-bearing) loan from the orthodox, banking system. Though this modern, usurious banking operation has been condemned by Christianity and other religions for centuries, it still operates globally in this 21st Century. It is very tragic that centuries of this avaricious practice have loaded most of the developed nations with massive national debts, and annual debt-servicing charges (usury) at hair-raising amounts of money. Such economic control inhibits real wealth production, thereby denying 21st Century man the benefits and ultimate evolution of his enhanced technology. For economics, there is always a better way to go, and it is really a very simple strategy. Given the ease of modern technology, credit creation need not be a global banking monopoly. Elected governments in the western world and in the Philippines have the authority to create and issue, interest-free (usuryfree) money for their people. Yes, it is true. Historically, for brief periods, usuryfree money creation was successfully achieved, and well-documented in Great Britain, America and Australia. But such beneficial effects were prevented in perpetuity because the powerful, international banking cartel was madly jealous of its privileges and in each case, they quickly planned and seized opportunities to take back their monopoly control of money, while the ignorance of an uninformed citizenry lost the amazing privilege of what they had temporarily gained. This cycle must change, but it can only change when an enlightened populace of re-educated, Filipino people, are thoroughly alerted to the scam of modern money creation. The Filipino people must learn about workable theories of money creation, and how these theories can best be implemented and controlled by the Philippine Government for good purposes that will benefit their common welfare. So let the debate begin on the modern money system by searching for, finding and sharing both printed and online resources that will explain how usury can be abolished – thereby eradicating poverty forever. The public - the multiple millions of debtors who are victims of modern, economic adversity, and who are experiencing monetary or financial problems, must be open to educating themselves about how this usury-based, model of debt money is threatening their lifestyles, their security, their current and future job prospects. When they fully understand what is happening to them is by design and not be accident, they will be motivated to action. Money – or truly stated - the lack of money - is the restraint that places a limit on many vital areas of human endeavor and it is the purpose of various discussion paper-proposals that have been prepared and are now available for study. The other limitation on what we can hope to achieve, either individually or jointly as a society, is the availability of resources. We cannot make bricks without clay, clothes without cloth, girders without steel – and the requisite acquired skills to bring these benefits into existence. But we have enough resources in our country and in the whole world in this age of plenty, what we are lacking is fair and equitable tokens – that we can use to negotiate trades/exchanges. 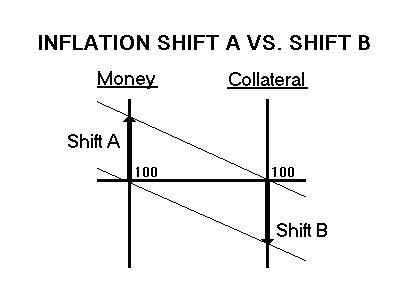 Ideally a modern cash economy should be geared to achieve a fine balance between these two main factors, money and resources. If the need is there – say for a specialist hospital to cure a range of human ailments – or a technologically-based campaign to clean up polluted atmospheres – then what is clearly recognized as a social benefit and a boon to future generations should not be put off, delayed or hindered by an apparent or even real lack of money. Yet money – not the availability of labor, skills and natural resources – has been universally portrayed as the limiting factor upon the even the most praiseworthy venture. We have been always deceived and conditioned by our political and banker/finance appointees, our financial and economic soothsayers, to believe that there must always be a shortfall between what is desirable and what is financially possible. We have been erroneously, let to believe that whatever the benefits advancing technology may place at our disposal, there must always be a degree of human need and deprivation that will be forever unsatisfied. This defies the achievement of true economic and social justice. Money and resources! Resources and money! One is tangible, the other is somewhat elusive. Yet it is upon the marrying and the harnessing of these two concepts that mankind must depend for an improved level of all-round prosperity amenity in the future. So where does the problem lie? Perhaps the problem lies in the nature of money itself! Most people’s appreciation of money is based upon their everyday experience of life. Children get their first acquaintance with money through simple coinage, when they find what buys them goodies at the sweetshop. At a later stage the interest switches to banknotes or ‘paper money’ or ‘folding’ money, as larger outlays and earning capacity make it a more convenient medium for carrying, exchanging and storing wealth. Then the youth gravitate towards the convenience of plastic cards and commonly get hooked with credit cards, debit cards and to a lesser degree - check book money. Most adults conveniently pay their debts with plastic cards or by scribbling a certified signature on suitably inscribed pieces of bank paper. Much of the modern concern as a wage or salary earner is devoted to ensuring that one’s bank and mutual society account stay in balance. If not, debtors are commonly and harshly penalized by the modern, banking system. That is normally the extent to which money impinges upon our personal lives or family life. We have become familiar with it as coin, banknotes or paper money or credit. But unless professionally engaged in banking or finance, common people only come in contact with a tiny fraction of the total amount of money currently in existence in our country and in the whole world. Millions and billions of dollars of government and institutional money float forever above the heads of common debtors. Debtors are often hard-pressed to deal with their monthly commitments and obligations. This is usually the case in dreadful poverty and where there is chronic shortage of money or lack of income. The horizons of debtors are commonly clouded by the next unpaid bills, and in such a terrible predicament money appears to be not only scarce, but also finite, with a limited supply to go around. As a populace in poverty and pressuring money problems, debtors are always groomed and conditioned to experience fears about the lack of money. In dire economic circumstances, there is often a carefully cultivated scarcity at the lower levels of society. Yet money in the larger sense is never finite, and is continuously being created – and destroyed by the banking system. So who are the creators? Mainly the central banks, such as Bangko Sentral Ng Pilipinas in the Philippines, the Bank of England in Great Britain and the Federal Reserve Bank in the USA, or the international bankers - both multilateral and bilateral financial institutions and the big private banks, which are beholden to the BIS (Bank Of International Settlements) in Switzerland. The banks create money when they buy government securities such as Treasury bills, etc. and it is money creation in its absolute form because the checks that they write to buy the stocks are not covered by either collateral or deposits. Yes, the privilege of creating this money has been conferred upon the central banks by the governments, that is, by the Philippine Government, US Government, British Government, etc. by the constitutional mandates to create all the currency and credit needed to satisfy the spending power of Government and the buying power of consumers. Few people in the world and almost none in the Philippines question the validity of this procedure, since it works smoothly in practice, and is an indispensable element of modern finance management. But as a Filipino Monetary reformer and a student on monetary science and all my colleagues in monetary reform all over the world claim that the treatment of the newly created money as an interest- bearing (usury-bearing) loan between Central Bank and the Treasury is the root-cause of economic stringency and instability, since it results in an ever-increasing burden of exponential and unpayable, national debt. No. 4 – Who’s Money Is It? Here we must necessarily come to a clear point in this debate or argument. This is where we have to separate reality from myth, logic from prejudice, public credibility from spurious or false protocol. We have established from facts and documents – and it is not disputed – that money is created when a central bank/private bank/international bank purchases securities from the Treasury department of a state authority. 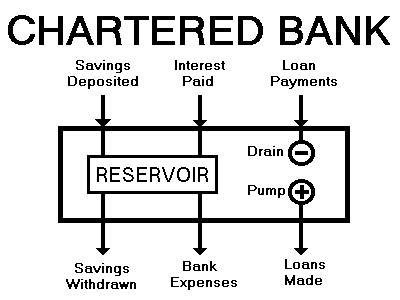 The fact is that the Bank pays with check drawn upon its own reserve account, which we know to possess neither collateral nor deposits, but to be both credible and acceptable because it has the backing of the government and all its resources. It is important to note that people are considered to be resources by government, as they provide the labour to transform natural resources into consumer products. So the money or a figure has been created out of nothing, out of thin air, out of ink and pen or out of computer digits electronically displayed or printed on paper. This usury-bearing debt money instantly commands respect and acceptability through its linking to the nation’s credit. That, and the fact it has been vouched in payment of government stock, which among the major industrial nations or rich nations is reckoned to be as good as gold. But whose money is it? Abraham Lincoln, the titanic figure who guided the American Republic through Civil War, insisted that such ownership indeed belonged to the people, to the citizens, and the privilege of creating and issuing money on their behalf was the supreme prerogative of the Government. To support and prove this contention, he decreed some US$40 Million to be created for the funding of the war efforts, and this precedent might have been repeated according to needs had he not been assassinated in his hour of triumph. He was reportedly assassinated by the agent of the bankers. Fifty years later in UK, a British chancellor, Lloyd George, ordered the creation of UK 300 Million pounds sterling in Treasury notes to use against or overcome serious liquidity crisis during that time at the onset of World War I. And like Lincoln’s ‘greenback’ money, the notes were created interest-free (usuryfree), for the benefit of both Government and the people. In the book “The Financiers and the Nation”, the author Rt. Hon. Thomas Johnston, M.P., a former Privy Seal, claims that the same procedure might legitimately have been adopted for further prosecution of the Great War, had the powerful banking cartel not convinced the Government to borrow the money in the form of a War Loan. In the Philippines, when Independence Day was declared by America on July 4, 1946 and proclaimed by President Harry Truman, the Commonwealth Government remained where it issued interest-free (usuryfree) money. However, in a very short period of time when the banking system was subsequently rehabilitated and strengthened as patterned after the US Federal Reserve System, the interest-free (usuryfree) money creation was very limited. 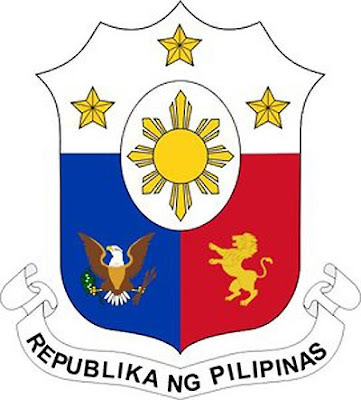 Like US Federal Reserve System, the Central Bank of the Philippines was established in 1949. It was controlled by the American Federal Reserve Bank and other global banking institutions. In 1986 the Central Bank of the Philippines became independent as provided by the Constitution. By the pressures of the US Federal Reserve banks and the foreign-international banks, the Central Bank of the Philippines was also forced to introduce trade and currency speculations with trade and exchange controls for 10 years. In 1961 the Philippine Peso was allowed to float at the exchange rate of P2 to US$1, but now at approximately P45 to US$1. In the critical years of 1980’s during the time of great President Ferdinand E. Marcos, he vehemently opposed the system of the IMF and WB, proposed debt moratorium, and cessation of debts and from his Martial Rule Power. The reign of President Marcos did not last long as he was under heavy attacks by the International Bankers. He was destroyed by the economists and the political oppositions, and eventually dethroned from power by a stupid popular uprising. President Marcos was accused of corruptions and dictatorships, but until now these accusations have not been proven true. President Marcos fought hard against the policies of the IMF. He had in mind to create all the Philippine money by a seniorage system through Central Bank of the Philippines instead of borrowing money at interest (usury) to the IMF/WB and other international bankers. His dethronement was an international plot fomented by the international financiers and global manipulators. The People-Power Revolution I followed President Marcos’ reign of power and this eventually led to the appointment of Mrs. Corazon C. Aquino as President in the 1980’s, followed by President Fidel A. Ramos in the 1990’s. His reign of power was followed by President Joseph Estrada in 2000 but he was also ousted from power on the preposterous accusation of economic plunder and yet until now this accusation remains unproven. President Joseph Estrada’s reign was followed by another People Power II Revolution that eventually appointed President Gloria Macapagal-Arroyo to reign from 2001 until 2004 and she was re-elected once again. The current president is President Benigno Aquino who assumed office on June 30, 2010. All these administrations have been (and still are) under the foul plague of debts under the infamous usury-based economic system of the International Money Mafia-Bankers in the holocaust of deadly penury. Their terms in office have been suffocated by the massive internal and external debts at hair-raising and skyrocketing interest payments. Under their terms, forced by memorandum of agreements with the transnational banking institutions, many of the bitterest economic pills have been swallowed to agree and undergo the economic policies and structural reforms for further borrowings under the tutelage of the Machiavellian and infamous IMF-WB. By taking a closer look at the implications of these dramatic events or historical instances and having them fresh in one’s mind, the reading public will get a better view of the present savage cruelty of debt and poverty in the Philippines and in many other countries. It is noteworthy that we have had money created and issued for public use, interest-free (usuryfre) and with no further obligations or posterity or descendants. We also have had money created by a central bank selling securities to our government Treasury Department at varying rates of interest or usury, thereby, piling up irrevocable debt which has to be serviced by not only by this generation, but also by future generations. This cycle of debt is unsustainable and is (and will be) impossible to repay in the foreseeable future under this faltering usury-based, debt money system. So what is the determining factor? What really makes these models different? The central bank financing through the purchasing of securities at interest (usury) is regarded at the norm, while Lincoln’s usuryfreee, ‘greenbacks’ and Lloyd George’s Bradbury usuryfree, pound notes and Marcos usuryfree, Bagong Lipunan notes have become historical curiosities at the respective, national and provincial museums. It is indeed difficult to argue and clearly not good enough to be always on debate about these issues. There is much evidence to support the fact that the global banking cartel authorizes the central banks and international banks to create what is fraudulently referred to as ‘sound money’ or ‘printed money.’ This money is commonly issued at whim and without discipline, for mere political advantage. We-the-people must learn about the process of creating money, and when we do we will realize that under such procedures the funds are being created out of nothing. Simply stated, assets already in existence are being further monetized. Why do we not bother ourselves about how money is created? Do we see any link of poverty with the act of modern money creation? Is seems like a difficult subject or concept. Neither our government leaders, nor our religious leaders, nor the common people have been able to grasp and comprehend the simplicity of the scam of modern money creation. If we are serious about enjoying true economic freedom, we must make an effort to educate ourselves and then take responsibility to educate others who are ready and willing to be re-educated. Though we think we are born free, we are really slaves of debt at the moment of birth! Consider the various forms of money or paper bills or negotiable tender currency that may pass through our hands or touch upon our lives, from birth to death - by far the highest percentage is a form of invisible credit, authorized by the signature of a debtor on a promissory note, and then created by a creditor (banker) either as ledger entries or a series of digits on an electronic computer. We are commonly blinded to the fact that the interest (usury) portion of any and all of these forms of debt money is never created and issued into circulation. The solemn mystique of modern money creation that fosters the reality of poverty, scarcity and lack is the simple fact debtors everywhere are signing impossible contracts with creditors – where it because of the shortfall, it becomes impossible for all debtors to repay both the principal and interest (usury) portion of loans/mortgages. In the future, will we have government political leaders and legislators who can deal with such matters? Currently, many of them are simply content with themselves, with their salary as they believe they are entitled to, their full bank accounts and cards, spending money extravagantly and immorally. They are content to appreciate the characteristics and uses of physical money such as deposits, banknotes or paper bills and cons, and almost none of them have come to understand the fundamentals – and the need for democratic control – on money creation or creation of credit. Money creation is the subject that transcends, in priority and importance, virtually any other political or social issue. It transcends because it impinges upon the political power and social opportunity. Money is the machinery by which political and social objectives are given practical implementation. The machinery of modern money is not properly understood and its functions have not effectively been brought out to public advantage. Therefore, what is being perpetuate is that all-too-familiar pattern of reduced expectations which is the economic malaise of the 21st century that is presently devouring our nation and our civilization. This first proposal has dealt with money and resources. It has touched upon the limiting factor which has to be imposed when new money can only be obtained as interest-bearing (usury-bearing) loans from the banking system. It raises the specter of an ever more onerous, odious and pestiferous burden of Domestic and Foreign Debts. In the Western countries where there are growing numbers of alternative economists and monetary reformers, many of them have been exploring for alternative solutions, their minds have been directed towards a solution of this mind-boggling problem since it was first highlighted by C.H. Douglas in Scotland. Over the years much has been done by the bankers and their appointees to confuse and obfuscate the issues, since any breach of their monopoly or control rights on the creation of money or credit would strike at the basis of greedy thirst for power. There are many other aspects of life in our free society that require attention, but this issue of money creation for the ordinary citizens must be addressed and ultimately solved for life preservation and secured sustainable living. Many researchers agree that when usuryfree living becomes a reality, many other societal problems will likewise be solved simply because the main cause of these problems are rooted in the function of usury which directly and/or indirectly causes wars, violence, poverty, scarcity and lack. Certainly, as the orthodox economic system of usury-based, debt money continues to grind adroitly into an ever more corrupt mess, the usurers will increasingly defend by all means the status quo that is forever eroding our freedoms. What can we do? No. 6 – The Need for Public Awareness: Filipino People – Wake Up For The Sake Of The Children! At this stage questions arise or must arise: If usuryfree money creation is really possible, what is the most critical thing that must be done immediately to address our tormenting problems of debt and poverty now and for the future of our nation? Why should the burden of urging it forward fall so heavily upon the public at large? Why shouldn’t the government leaders and the many highly paid academics, economists, and politicians with greater means and opportunity be advocating for the government to create usuryfree money for we-the-people? Unfortunately, most religious leaders and common clergy have also been co-opted to serve the global banking power instead of serving the people by exposing the evil and immoral aspects of the design flaw of usury on our orthodox economic system of debt money. The answer is difficult and complex here is my attempt to answer to that question. We must continue to dwell upon and expose the centuries of power and patronage that the bankers have conferred upon themselves by their monopoly control of the money system. It is a belief – which is true enough – that money – if you have enough of it – can be used or made to buy almost anything in the world. And the bankers, through their adroit control of money or credit, have at their powerful disposal virtually all the money in the world. The powerful money creation enables the bankers to go hostage gathering in every sphere of public life. It is indeed their interest to do this, and there is much evidence that they they have been doing so for a very long time. The global banking cartel has been buying up loyalties of newspaper magnates, public and private news media commentators and leading politicians. In this 21st Century, the global banking cartel has absolute control of all print and electronic media - newspapers, radio and television stations – as well as universities, colleges, schools, institutions, governments and even the religious organizations and their clergy. They keep a watchful eye over their businesses to control money and population. Hence, those who want to prosper in their chosen calling or jobs or employments are compelled to observe the banking protocol. The danger is that if they step out of line and get curious about the bankers’ credit monopoly, or they start discussing the possibility about economic power being restored to the people, they are liable to find that their financial backing removed or they will be targeted by injurious media campaigns that will quickly destroy their prestige and credibility. At present, who would be the best Filipino government official or leader or any charismatic leader could imitate or emulate Lincoln or Kennedy or Marcos – all of whom dared to create workable models of usuryfree money that would give financial power back to the people? Can we seriously contemplate this in 2012? How can we best obtain a wide degree of public awareness and strong public opinion in order that this proposal of the government creating usuryfree money for the people cannot just be cast aside? Back to the People! This concept may seem revolutionary or outlandish, however, in this new technological age of plenty where specialists or experts abound in all recognized sciences and disciplines, surely we can find enlightened citizens who are willing to restore that eternal vigilance that will help to usher in this new age of usuryfree living for not only Filipinos but for everyone on planet earth. In this age of unsurpassed communication skills and opportunities, the greatest need is for the people to learn about and share the simple truths about modern money creation since without significant monetary reform, we can never get a proper utilization of our country’s bounteous resources or of our planet’s natural wealth. Indeed, fellow Filipinos who read this, and realize what it is saying, are imbued with a certain responsibility to help change the system for the better. For a good starting point it is recommended that Filipions who are motivated to action, follow the lead of those local communities all over the world that are bartering/trading and supporting local entrepreneurs by learning how to create and spend their own usuryfree time currency. They are invited to study and examine the successful and workable models of usuryfree time currency and then launch such models in their respective local communities to facilitate the re-birth of local bartering and trading products and services. ? Such action will accelerate the re-education process as people will have an opportunity to experience the fact that these time currencies are free of interest or usury. With some experience, the people will soon demand that all levels of government take a leadership role and accept these usuryfree time currencies as partial payment for taxes. This is possible because every level of government employs local people and engages in contracts for products and services with local businesses. Who now believes in usuryfree money or people’s money, and who still needs some persuading? Many have become thrilled with the concept of nations creating their own usuryfree money or credit. Be forewarned and do not be confused and neutralized by the first blockbusting rebuttal issued on behalf of the bankers? There are two levels on which there has to be clarity of conviction. Firstly, be fully aware of the immense benefits that would accrue from the government or state exercising its ability to create all or part of its own financial credit outlays – without the function of interest (usury). Secondly, in the knowledge that procedures and strategies are readily available for achieving this, and that only public ignorance and the bankers’ pressures have prevented earlier historical instances from being perpetuated, know that the power of the bankers lies on the ignorance of the people about modern money creation. The problem about reforming the money system is that there are many skilful government officials, economists and experts in the Department of Finance and economic faculties who stand ready to defend the established practice of issuing all new money as a debt upon society. They always say and gravely insist that usuryfree money creation would be vastly inflationary. This is a myth. One only has to study and comprehend these lessons by John Turmel – who proves that the function of interest (usury) on money is what creates inflation. It is highly unlikely, that governments when presented with the opportunity to create their own funds as an interest-free or usuryfree currency would use it to promote, selfish schemes and fantasies thereby debauching the currency. Under the watchful eyes of informed citizens and faced with the awesome responsibility for creating and spending a nation’s resources, the Department of Finance and Treasury officials, the House, and Senate Committee officials and the members on Finance and Economics will be required to be operating within a discipline that honors honesty and integrity and prevent them straying from the paths. Unfortunately, down through the centuries, since the formation in 1694 of the Bank of England, the formation and establishment of Federal Reserve Central Bank of USA in 1913 and followed by other Western-based nations, and the establishment of the Central Bank of the Philippines in 1949 as an independent institution, the maintained discipline fostered deceit, deception, selfishness and greed – simply because requirement was that new funds should only be made available as an interest-bearing (usury-bearing) debt money and the ultimate effects of this was never fully understood by the people. Today the local and national economy in the Philippines – as elsewhere – is reeling under a preponderance of debt with skyrocketing interest (usury) payments to commercial/private and international banks. Most taxes levied by the government are used to pay the interest (usury) on outstanding debts. This is an example of legalized robbery to fulfill the mandate and dictates of the International Financiers. Societies are existing in the most stressed financial circumstances, people are in dreadful monetary and material poverty, starving, deprived and desperate in the midst of plenty. This is happening because of the defective and malfunctioning debt money system based on usury – simply because of the protocol which commands that new credit can only be made to materialize as a charge upon the debtor – whether that debtor is an individual, a family, a business, a corporation, a province or a country. Having thought about it and having studied the implications, are you willing to go on accepting it? Wake up, Filipino people! Just because it is something you won’t ever see debated in economist papers, or in the prestigious columns of financial editorials, are you willing to go on believing it’s a problem that doesn’t exist? Or if it does exist, and you know it exists, are you afraid to talk about it for fear of causing offence in high places? Do not be afraid – be courageous, learn what’s really going on in the local, national and global economy and dare to teach others and make a difference. In view of the present deadly financial situation in the Philippines, this is the time to choose: (a) between an intellectual honesty which seeks the truth and goes on seeking regardless of pressure or convenience; and (b) a financial orthodoxy which, to protect its own protocol, creates selective no-go areas within the human mind. The bankers defend their banking industry; defend their rigid financial swindling practices, even when they are so obviously at variance with our expectations of social/economic/monetary justice. Why? Presidents and prime ministers, cabinet secretaries, senators, congressmen, governors, mayors, and all government officials, and clergy - all of them speak with such respect and reverence for the banking institutions from which they borrow the nation’s money, that it might seem almost an affront or an insult and an impiety to question or doubt their motives and their judgment. It is unfortunate that in the high places of government, alternative methods of creating money or credit to address the groaning and moaning problems of poverty of the majority are not mentioned. It is as though these usuryfree currencies never existed: Lincoln’s ‘greenbacks’, Lloyd George’s Bradbury’s and Marcos’ Bagong Lipunan currency. There are no clumsy lies or evasions, just a bland ineffable commitment to the system as it has always been operated. It is sad indeed that economic history has been written here and managed, with such inconvenient episodes edited out and consigned to the dustbin of posterity. Over all, the preponderance of power and patronage can be totally confusing or disconcerting. Nothing in our upbringing has prepared us symbols and emblems of authority that so clearly mitigate against the public good. We are up against Established Order, with only our logic and our intellects, our sense of JUSTICE and our moral values to tell us truth from falsehood, right from wrong. Revolutions are made of this. In this 21st Century, it will surely take a revolution in economic or monetary thinking, a veritable upheaval in widely based conceptions, to force a situation in which governments no longer feel compelled to borrow at interest or usury, but are able to supplement their budgets by judicious issues of the people’s money – without exacting usury. Philippine Government, Do It Now! Money reform will only come about by popular demand. It can happen no other way. The issue of usuryfree money or people’s money is one which can only be settled by the people themselves, by the Filipino people, however, they cannot do this until they have been properly alerted and they will not be alerted until the subject can be openly debated. As it was said in the beginning, it was really very simple. That is the level on which the debate must be continued; not by the slide rule and the calculus, and the massive computer banks of analytical data compiled by the modern economists, but on the simple logic of who owns what – and whether money should be the servant or the master of man. Filipino ordinary people – don’t have to concern themselves with technicalities. That is a job for the professionals. A democratic public can defend its freedom by simple insistence on the principal alone – and the principal in this case must enshrine a usuryfree, money system that benefits humanity at large, while curbing the immense power and patronage currently enjoyed by the oligarchs of finance. Those who are closest to investment and currency markets, and to the complexities of the modern financial system, are unlikely to be receptive of any plan for reforming the system or for changing things. Billions to trillions of money in US$, Philippine Pesos, UK pounds sterling and Euro currencies, yen, etc. are traded, gambled, cashed, invested, vouched, created and cancelled in any single working day. The bedazzling flicker of the astronomic numbers warns all but the hardened operator to steer clear of matters that seem to be beyond their comprehension. Fortunately, it is not an issue that need concern us directly. Crash courses in market speculation are neither necessary nor recommended. For even in full cognizance of this sophisticated world within a world, this casino of invisible levers and mighty fortunes moving around at the flicker of an electronic button, we have to stay rooted on first principles, and let the constant bedlam of international brokerage, deal-making and currency gambling pass right over our head. Why? Because it is money or credit that drives this intricate and outwardly bewildering machine, unlimited and invisible credit based on the banking system’s concessionary right to monopolize the creation and issue of money. So the technical know-how, the twists and manifestations, the dazzling sophistications, must be viewed in relation to that single point of principle upon which our discussions began. The machine is out of control. This massive financing, investing, marketing, speculative, and gambling machine is completely beyond any form of democratic control. That is because Governments have collectively given up the right to create and issue the People’s Money or Credit without usury. Democracy started to die when politicians abdicated its powers in favor of the banking system. Now so-called democracy is sick and corrupt and pathetically inept in face of the true power, which is the global financial power. Think on these things, you who were born a democrat, and assumed that because of the sacrifices and clear-sightedness of our forefathers, such freedom were guaranteed forever. There are ominous signs, borne out by the visions of both Menzies and Lincoln, for in the global situation evolved by an unregulated, international money power, it is doubtful whether democracy can flourish again – or even survive the vicissitudes of the next century – without taking back some control over its own credit. There is one area in which the financial establishment has recently been obliged to concede the principle of usuryfree money. That is the issue of banknotes and coins, where, following some intrusive probing by the Economic Research Council in 1980, it was, revealed that for the UK at least, the pound sterling on one’s pocket had been obtained without any increase in the nation’s debt. The procedure, as explained in the ERC booklet entitled “Government Debt and Credit Creation” (Dec. 1981), is for the Government and Treasury to underwrite for each new cash issue an appropriate amount of securities, which are then lodged ‘sine die’ with the Issue Department of the Bank of England. Monetary and economic reformists, observing this, and seizing upon it as an already accepted method of obtaining usuryfree national finance, have suggested that the principle – and the issues – should be extended till they had a real effect on government borrowing, and erased the worst features of the usury-based, debt money system. Blandly the oligarchs have replied that they could see no possible justification for such a vast expansion in the supply of PHYSICAL MONEY – that it would be impracticable to store, and the economy couldn’t absorb it – and because there has never been an established forum for the debating of such proposals, no public opportunity has been presented for exploring the implications. Yet these are vast and far-reaching. It is patently absurd to insist that an Authority which can order the creation of usuryfree physical money should not also have it within its powers and its competence to create credit. Upon the vexed question of how much should be created, nothing is more finite than the proposal propounded in ‘The Money Bomb’ by James Gibb Stuart in 1983 – that Government, on an annual basis, should lodge with the Central Bank (Bank of England) securities equal to the interest on the National Debt, and authorize it, as agent, to make out the payments to the debt holders. Since it is now self-evident that further borrowings are only necessary to pay the interest (usury) on previous borrowings, that particular drain on government finances would cease, the debt would stabilize at current levels, and Presto! our elected politicians would find that they had regained control of the people’s money. We said at the beginning that it was really very simple. That is just how simple – provided we stick to principles, and are not phased or distracted by technicalities. All that is needed is open discussion and debates. The finance oligarchs are ever fearful of having to face such debate. For the radical campaign on Social Credit monetary reform policy, monetary/economic justice, cancellation debts, and usuryfree money, for the promotion of ideas-opinion-based materials on environmentally-economically-politically-viable-alternatives for economic democracy for the Filipino people. Eric Verzo Encina is a pragmatic and straightforward Freelance Writer on Social Credit Philosophy, Monetary Reform, Alternative Economics and New Science of Economics. Eric is a well-known Filipino Social Crediter/Monetary Reformer, Activist For Economic & Monetary Justice. Eric has been involved in the activism-campaigns for life, family and justice for the innocent born and unborn children in the Philippines for almost 20 years in Luzon, Visayas and Mindanao. Eric is a native of Quezon Province, Mauban, Quezon. He was born on December 18, 1970. Eric graduated from Enverga University, Lucena City, Quezon Province, Philippines in 1991. He studied the Secretarial Course Education, and he was a former Seminary aspirant of a number of Catholic Seminaries and Conservative Catholic Congregations in Metro Manila. For a very long time, Eric has been a Correspondent Student on Social Credit, Monetary Reform and the New Science of Economics overseas. The “Michael” Journal, Pilgrims of St. Michael, Quebec, Canada declared him as the “first Filipino Social Credit Student” in 1992. Eric founde the Filipino Alternative Solutions For Sustainable Survival Movement in Roxas City, Capiz Province, Philippines. This project is now closed down. Eric writes intermittently for the Aklan Provincial Newspaper, the Aklan Reporter via online submission. He attends and engages in debates and discussions elsewhere in the Philippines, and he contributes regularly critical articles to overseas online publications. Eric divides his time traveling in the provinces and in Metro Manila through meeting with Government legislators, friends and with other campaigners and activists in Quezon province and elsewhere with his ancestral family members. He is sometimes ubiquitous in these places for the mission and as an agent he continuously works for the purpose of justice in the monetary system. He is looking forward into possible public office in the possible foreseeable future. Eric holds forums and seminars anywhere in the country as he has done in past years in the Visayas region, whenever possible on the pertinent issues being discussed in this book. Eric can be available by appointment for speaking engagements, radio-TV talks at minimum fee, and by arrangements even for public and private debates both in person and online. NOTE: This is one chapter from a book titled ‘The Savage Cruelty of Debt’ that is almost ready for publishing. Contributions, gifts to offset the printing costs of the book are invited and welcomed. Such donations can be sent via Paypal to: eric_encina@yahoo.com OR directly deposited in Eric's bank account.